If it looks like dessert, smells like dessert, and tastes like dessert, then it probably is… breakfast! 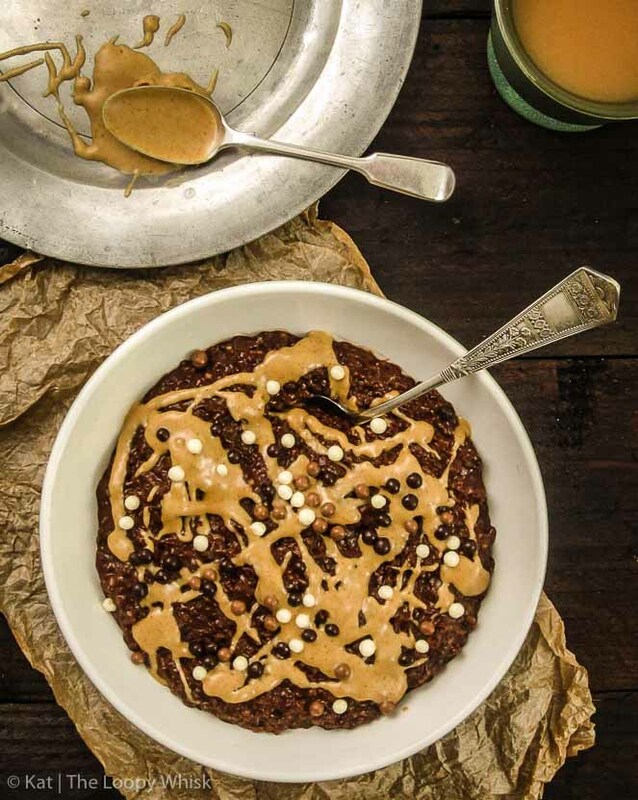 This chocolate peanut butter oatmeal is finger-lickingly delicious, and makes waking up very much worth it. 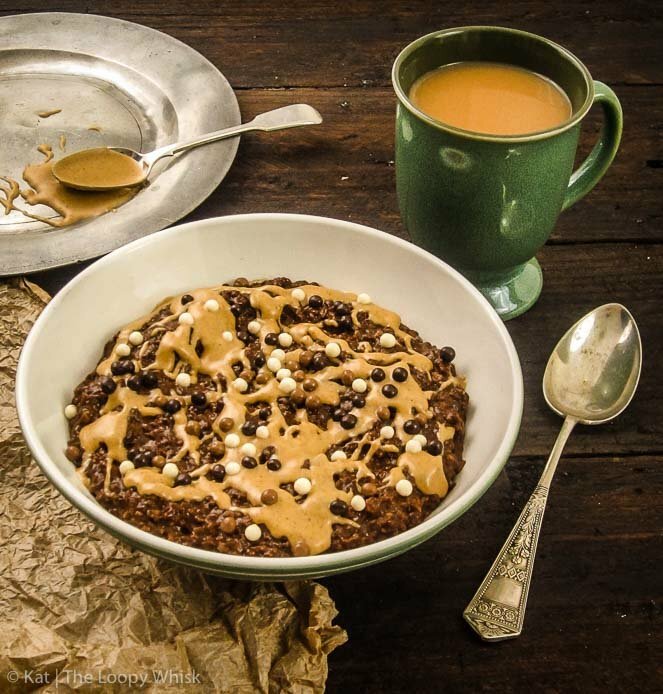 I don’t know about you, but getting up at 7am (or earlier) every morning during the week is definitely not on my list of favourite things to do (licking spoonfuls of peanut butter mixed with honey, though… is definitely up there). And there is realistically only one thing that can get me up from the lovely lovely warm and cozy bed – and I am not talking about the daily obligations, or new discoveries to be made, or anything quite as grandiose. Nope, I am talking about the greatest thing of all – food. Now, there will be posts where I’ll be going into the nitty gritty details of a balanced and nutritious breakfast – but this isn’t it. That is not to say that this. Chocolate. Peanut butter. 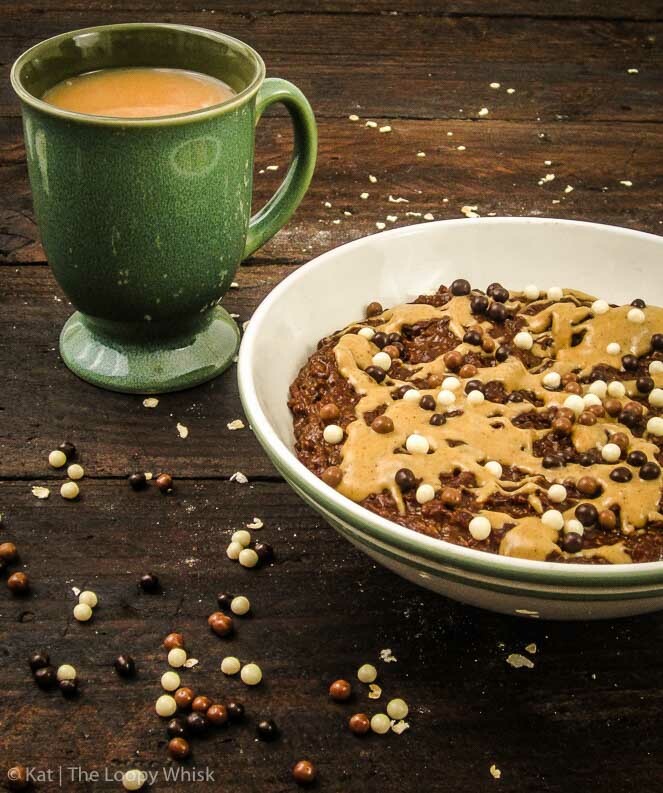 Oatmeal (because the former two most definitely deserve their own sentence) isn’t balanced, nutritious, and will keep you full well into the early afternoon. And, in case you were wondering, it’s also gluten-, dairy-, egg-, and refined sugar-free. But it’s chocolate. And peanut butter. 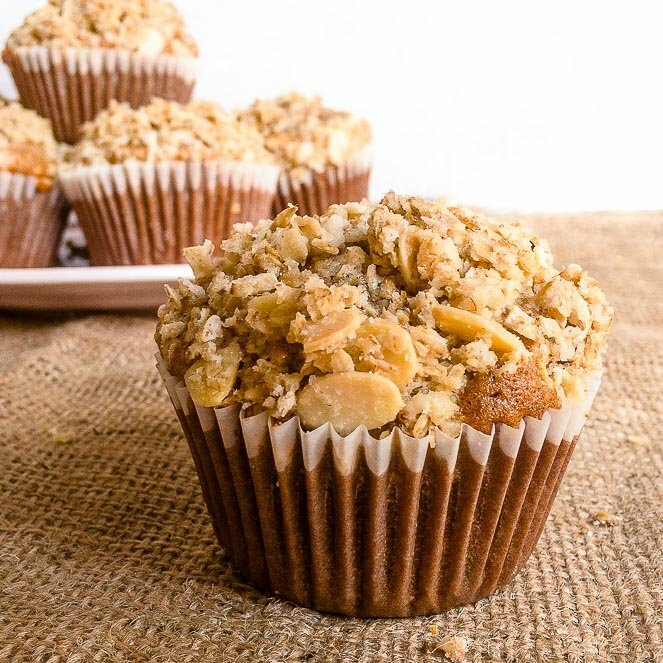 And this oatmeal falls in that ideal region between delightful fluffiness and luxurious thickness that makes you all woozy because you cannot decide whether each mouthful is closer to a chocolate mousse or a peanut butter brownie. 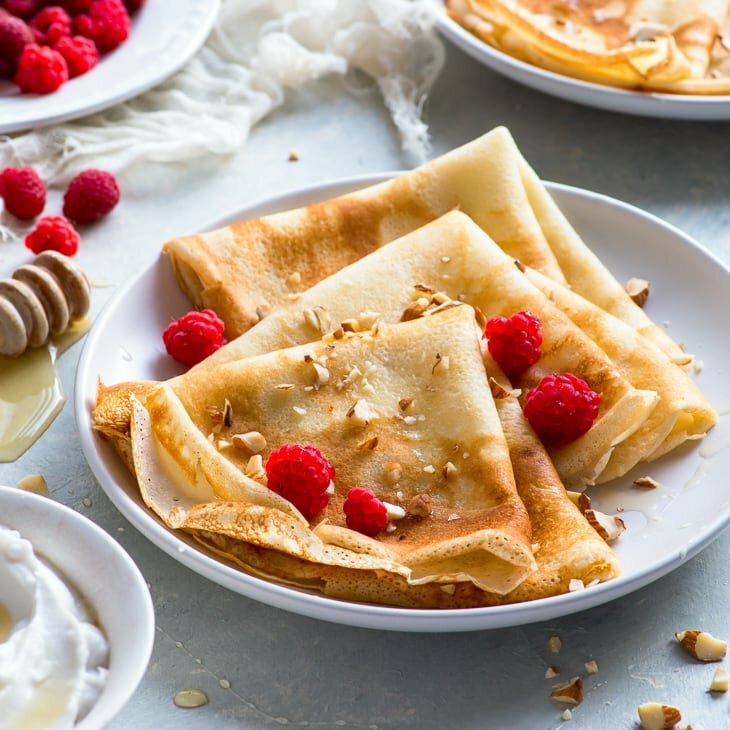 To make it more appealing (not that it needs it – because chocolate, and because peanut butter), it can be made in 10 minutes flat, even when half asleep and with the hindrance of door frames being in unexpected places, an occurrence so typical of early mornings. To make it even more simple and fool- (or early morning-) proof, you don’t actually need to stir the oatmeal during the time it cooks. That is a whole 4 minutes you can dedicate to more useful things, such as prepping lunch for the day, checking the latest post from The Loopy Whisk (hint hint), or staring at the bed, trying to persuade yourself it does not look awfully inviting. Not stirring the oatmeal might result in some parts sticking to the bottom of the pot, but don’t panic – just stir it really well, and you will get a homogeneous bowl of amazingness. The chia seeds are not there to make this oatmeal more pretentious. And while they do an admirable job of supplying extra nifty nutrients, such as the very esteemed omega-3 fatty acids, their primary job is to add volume and ‘bounce’ to the oatmeal. (The word ‘bounce’ in this context makes me picture a bouncy castle made only of oatmeal – quite disturbing really, but unfortunately I cannot find a better word.) 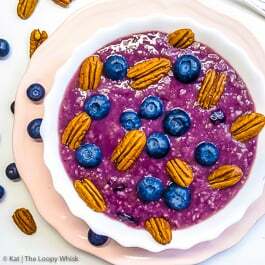 While not a fan of the highly popular chia pudding (frog eggs, anyone? ), I love love love what they do to the humble oatmeal. 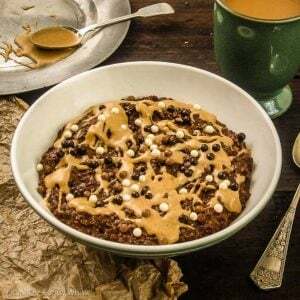 In addition to being responsible for the chocolate peanut butter oatmeal’s fluffiness, they also add the extra crunch factor, which is paramount if you happen to run out of the life-sustaining staple that is crunchy peanut butter. This oatmeal can easily be prepared in advance, if you don’t want to sacrifice the extra 10 minutes of sleep – which I totally respect. Keep it in a cool place, and either enjoy it cool or re-heat it in a microwave. And really, why restrict the consumption of this amazingness only to breakfast; after all, lunch and dinner by any other name are just a late (or very late) breakfast. 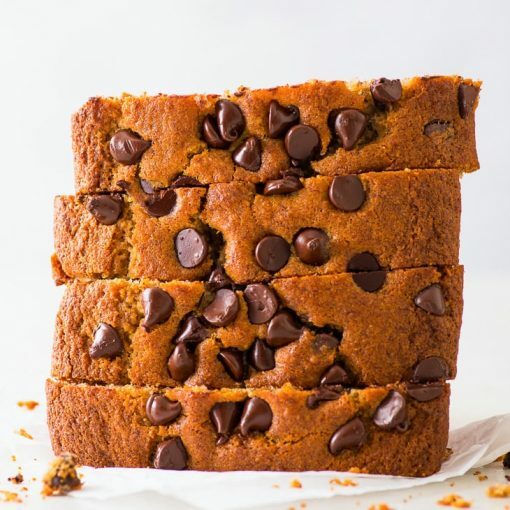 And if you accidentally-on-purpose add extra peanut butter or chocolate chips, well – that’s between your breakfast (or lunch… or dinner) and you. But I wholeheartedly support your rebellion. 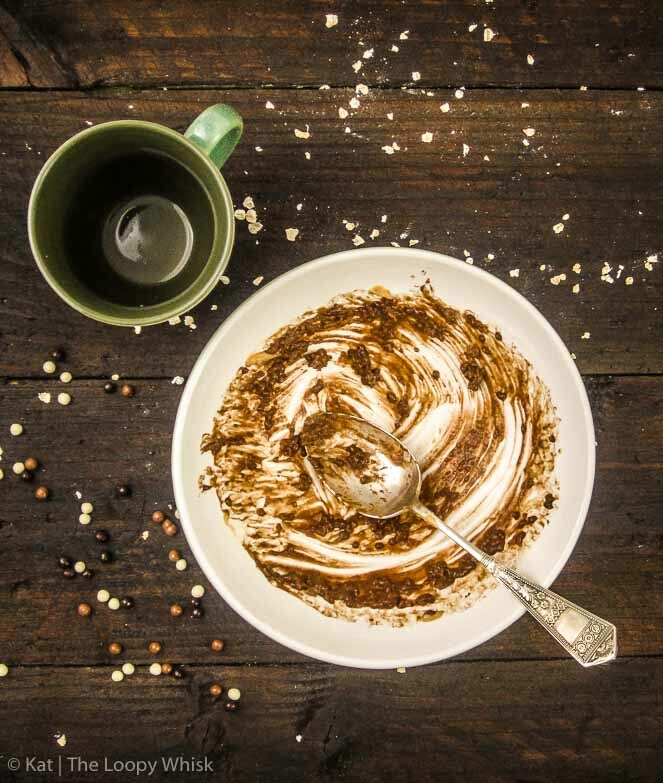 Mix together oatmeal, chia seeds, cocoa powder and salt in a pot. Add milk of choice and water, stirring thoroughly. After 4 minutes, remove from heat and stir in honey and peanut butter. Serve warm or cool, according to preference. 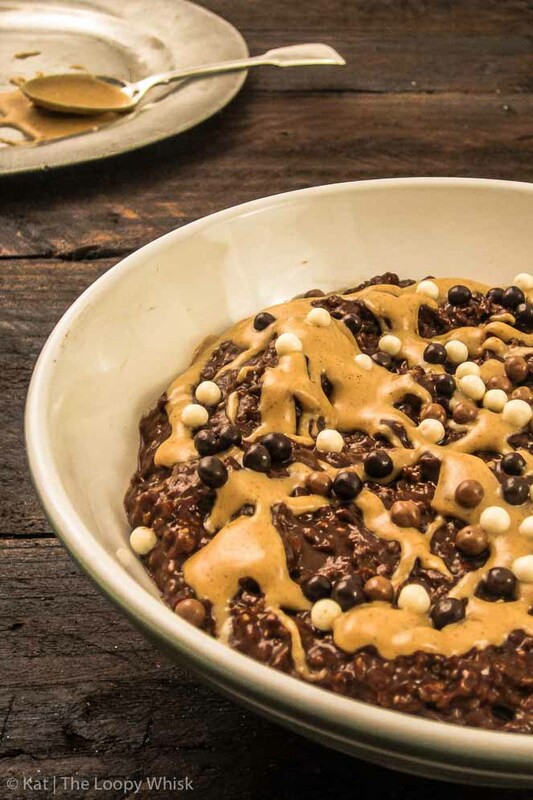 Enjoy topped with extra peanut butter, or chocolate chips, or both. The oatmeal can be prepared in advance the night before, kept in the fridge overnight, and re-heated in the microwave the following morning. Note 1: I will not tell you how much peanut butter to use. I leave it at your discretion how much or how little (not likely!) you add to your oatmeal. One does not dictate the quantities of peanut butter consumed. Note 2: If you decide to let the oatmeal do its thing, and not mix it while cooking, some of it might stick to the bottom of the pot. In that case, just stir thoroughly and the oatmeal will come together nice and thick and yummy.